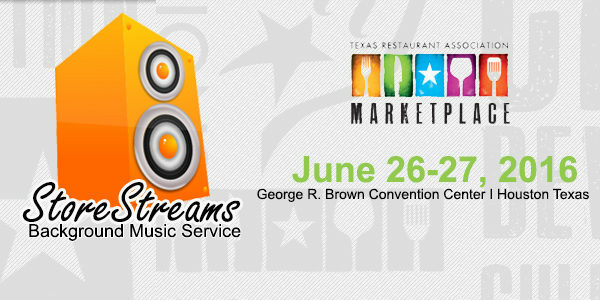 Austin, TX – June 23, 2016 — StoreStreams is introducing its complete audio/visual communications system; including unique audio and video communications feeds at the Texas Restaurant Show on June 26 – 27th in Houston, TX. The solution is a tight integration of the StoreStreams streaming music and messaging product with digital signage leader Scala and reseller Imperatives, Inc. Inter-M speakers and amplifiers complete the solution for playing your audio across your establishment. 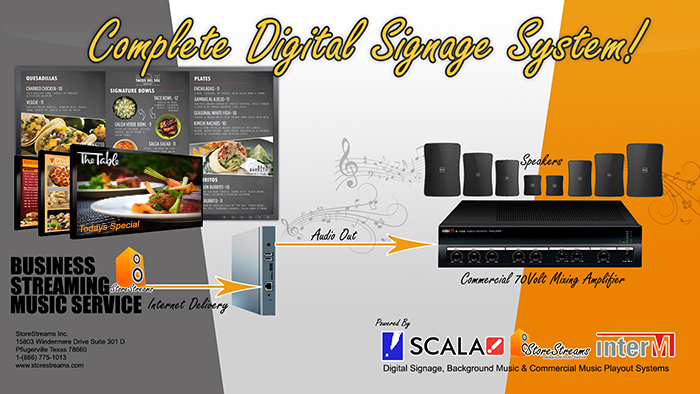 Separate audio and visual inputs offers the choice for completely independent background music and messaging, so the Scala player for your menu boards could be used for background music as well. StoreStreams is a customized business music and messaging solution. It enhances existing marketing campaigns by generating product interest through a fully integrated background music and messaging system. StoreStreams customers are assigned their own music manager to create perfect music mixes while incorporating messages ranging from advertisements to general information. StoreStream’s service is streamed through the Scala Player and delivers increased value and functionality to Scala installations through the ability to incorporate music and messaging to existing campaigns. All additions and support is still managed by your existing Scala reseller; however, the integration itself is very easy to implement. Imperatives specializes in providing Scala digital signage solutions to businesses and organizations. For the past 18 years, they have created turn-key digital signage packages for single and multi-site implementations. Imperatives’ goal has been to supply excellent products, creative services, content management and continued technical support to each client. By integrating StoreStream’s streaming service through a Scala Player, the combination delivers increased value and functionality. It provides the ability to incorporate music and messaging with eye-catching digital signage images. StoreStreams CTO Roland DeLeon commented that “our partnerships continue to yield great bundled solutions. The whole is truly greater than the sum of its parts.” StoreStreams will be at the Texas Restaurant Show in Houston, TX June 26 and 27th in booth 1637. StoreStreams is the turnkey business music and messaging service that integrates seamlessly within retail environments, providing access to a wide-ranging music catalog that complements the atmosphere of any business. Founded by musicians and music lovers, StoreStreams creates customized, branded radio channels that remove the elevator music stigma, and is driven by technology that ensures the highest quality sound. StoreStreams guarantees the highest possible uptime for live streaming services without interruption through its regionalized, redundant server environments, offering reliable and scalable services for both the single retail storefront and large business networks with thousands of locations.